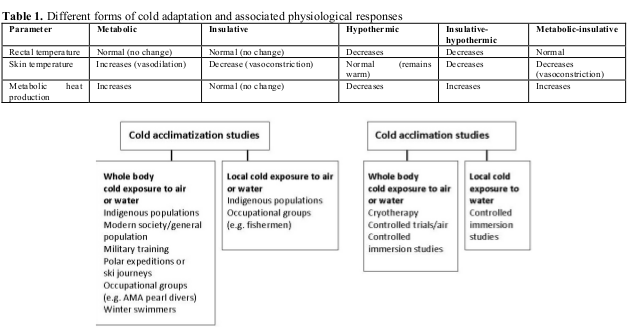 Tiina Makinen‘s “Different types of cold adaptation in humans” works as a meta-analysis of various scientific studies of cold adaptation and is a fantastic read and is available at the Finnish Arctic Institute of Health. It ranges over types of cold adaptation, (physiological, genetic, behavioural), acclimation and acclimatization in specific groups (occupational, indigenous, high latitudes) and certain affecting factors. Some areas such as genetic adaptability in indigenous people aren’t relevant for swimming. 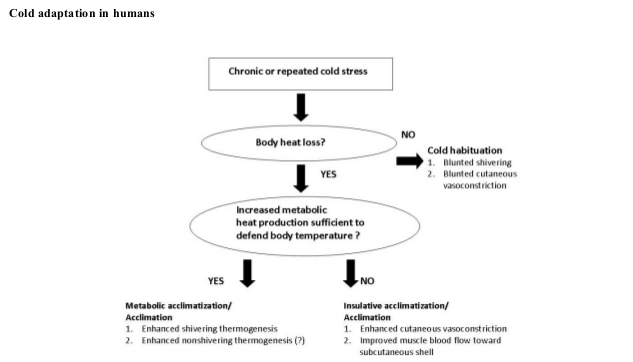 The paper does a great job of rounding up the various effects of cold responses, I’ll only summarize the relevant swimming ones. She lists three main types of cold adaptation, metabolic, insulative, hypothermic, with three physiological responses to each one. Figure one displays generally how these arise. For most of us, we fall into the body heat loss category due to swimming time. (However for short term experienced winter swimmers, I believe we can enter into the cold habituation category of blunted shivering, due to my experiences this winter, where I had little shivering or shaking). So this brings us the point that Finbarr made in the comments to the first post of this category, where he said we generate more heat, which is known as thermogenesis. Anyone who has read Lynne Cox’s Swimming To Antarctica may remember that on testing in controlled conditions (acclimation) she actually increased metabolic heat production. I seem to recall some other people testing at this also, but can’t find studies right now. The body is evolved to protect against a certain amount of cold by increasing heat. But thermogenesis is normally achieved by shivering, and to do this in air, not water. For swimmers therefore shivering is not good. But it’s still possible to increase heat (non-shivering thermogenesis, NST) through other methods. 1: Peripheral vasoconstriction, which we are all familiar with. The blood flow to the skin is reduced, retaining more heat by not dissipating heat from a higher blood flow through the skin & limbs. Again, from personal experience, Dee has noticed how much and how quickly my skin cools on even short swims, when I feel completely comfortable. Many of you will recognise this as a clammyness to the skin, but since your hands are also cold, you can’t really feel it. This is what Makinen calls an insulative response. 2: The second response, and we don’t think of it as response, since it’s the start of the process that leads to hypothermia, is Insulative-Hypothemic. In this our skin temperature reduces…as does the core temperature. Obviously unchecked, staying in cold water long enough, leads to a strictly hypothermic response (you get hypothermia). So as an experienced cold water swimmer, you are autonomically working on both these factors (amongst others more consciously). Table one gives the expanded responses available. Makinen also talks about purely Insulative adaptation. 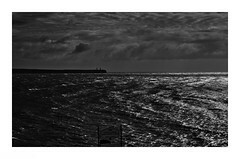 From our point of view however, I like to think of this one as a more conscious response. Sometimes, we put on more body weight deliberately. It’s a toll available to all swimmers. More weigh, as I’ve said previously, equals more surface area equals slower heat loss. Makinen makes brief reference to brown adipose tissue, brown fat, which I’ve mentioned previously. Here I’m going to personal observation. I noticed over the course of last year, that Rob, Gábor, Ciarán, and myself put on more weight particularly across our upper backs once we were in regular sea training. Jen, being female had a more whole body subcutaneous effect, but also had the morphologically changed upper back, while Liam had less time to adapt to cold than the rest of us because of his earlier swim date, and I couldn’t see up that high anyway. Other anecdotes within the Irish Open Water group indicate that this happens with regular exposure. Studies in the New England Journal of Medicine showed brown fat developed quickly after repeated cold exposure. Makinen notes that it is more likely in women than men, but those studies were in temperature reduced air, rather than water. The sites of brown fat growth are significantly in the upper back! Also , brown fat is metabolically active, unlike white fat, so it will generate heat. And despite a reasonable training amount since, at least for Gábor and I, we’ve lost that enhanced upper back/shoulders, which I think is because, though we swim weekly, we are not in often enough to necessitate brown fat, which would return once more regular cold water training would recommence. Did I mention my hypothesis? So yes, I have one. It’s nothing extraordinary but I’ll come to it.